As a multi-ethnic and multi-cultural nation, it is given that the food scene here will be diverse and interesting. Just like Singapore, Malaysia is a haven for foodies. The country has every authentic Southeast Asian dish prepared the way it is supposed to be. Plus the flavorful Malay dishes which has influences from all over Asia. We started our food adventure with dinner at Jalan Alor. After passing through the busy streets of the Bukit Bintang Area, we were greeted by the bright lights of food stalls in Jalan Alor. The whole street was lined up with outdoor restaurants, hawker stalls, fruit stands and food carts on both side. It was an amazing street that is dedicated for one thing alone, food. Travel Tip: The festive food atmosphere becomes alive during night time. So make sure to come here after the sun has gone down. 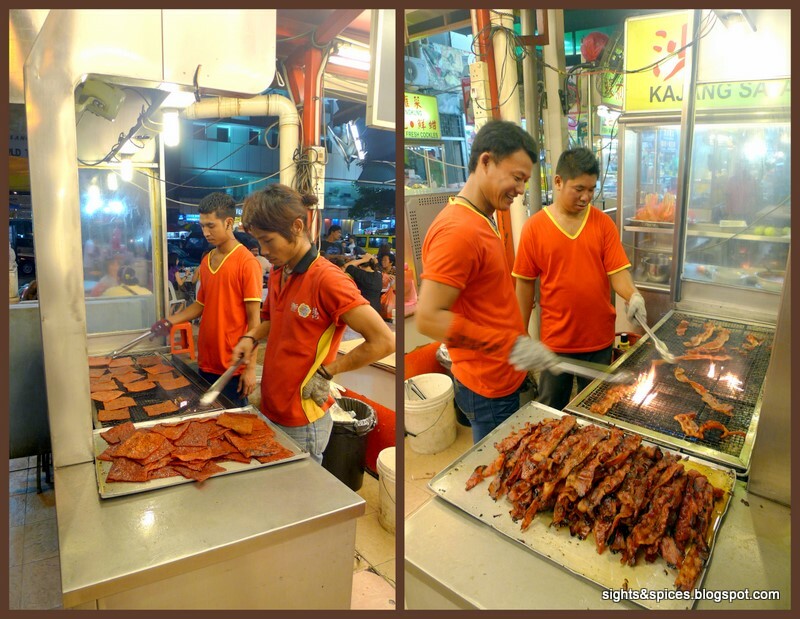 One of the first few food stalls that caught our attention was the Meat Jerkies that were being grilled. The scent of the grilled meat was so intoxicating that it was hard to resist not to grab a bite. The three of us shared a Meat Jerky and Floss Bun. I wished the piece of beef jerky was thicker but nonetheless it was worth what we paid for. We walked and stopped by a BBQ Steamboat Food Cart. There were an assortment of food skewers that people can choose. Depending on what you get, the food skewers are either blanched in soup stock, deep fried or grilled. There were three sauces that you can choose to put on your food skewers. Peanut Sauce, Sambal Sauce and a Light Soy and Hoisin Sauce. We had two skewers of Fried Bean Curd Skin, a skewer of Grilled Squid and a skewer of Blanched Crab Rolls. We tried each sauce and our favorite was the Spicy Sambal Sauce. Walking further, we stopped by a stall that serves Taho or Soybean Pudding. 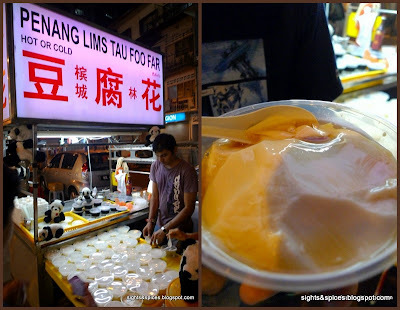 The Penang Lims Tau Foo Far serves hot or cold soybean pudding, we decided to try out the hot version. Just like back home, it was topped with a sugar syrup. The pudding was nice and smooth. After walking the long stretched, we stopped and camped out in front Cu Cha outdoor restaurant. We were given a menu to start our glutton spree. I scanned out the items and decided to order things that we didn't get to eat in Singapore. The dishes that you can find in Singapore can also be found here but the good thing is, it was way cheaper dining here. We started our meal with Char Kway Teow, a stir fried thick flat rice noodle with shrimps and vegetables. It was simple and savory, the perfect dish to start out our meal. Next up was the Bak Kuh Teh or "Meat Bone Tea". A pork rib soup that was boiled with different herbs and spices and simmered for hours. Also in the soup was tofu slices, mushrooms and Bokchoy. The soup was so flavorful and yummy. We also ordered a plate of Chicken Sate. Just like in Singapore, the chicken skewers were served with a peanut dipping sauce. I love how tender the chicken was and the char grilled flavor that came with every bite. Last but not the least, our favorite for the night, the Black Pepper Crab. The waiter brought a live Crab to show us that it was still alive and fresh. When the waiter came back and put the dish on our table, the wonderful distinctive smell of black pepper filled the air. The crab dish was such a treat, it was so flavorful and perfectly cooked. I liked the Chili Crab better we had in Singapore but Jim and Jon adored the Black Pepper Crab more. We washed our meal down with one of Malaysia's favorite ale, Tiger Beer. Being so full, we were not planning to have dessert until we passed by a Turkish Ice Cream stall. I was so intrigue on how it tastes like that I bought a chocolate amd vanilla ice cream cone. The texture was different from the regular ice cream, it was delightfully thick and chewy. The next day we were off to Melaka, it is said that this is the perfect place to try out Nyonya or Peranakan Cuisine. Nyonya basically uses Chinese ingredients mixed with the different herbs and spices found in Southeast Asian nations. Aside from Nyonya cuisine, I was also looking forward to try out food around the Jonker Area. We had lunch at Restoran Nyonya Suan, lucky for us the owner was there and she recommended what dishes we can order. We happily obliged and she ordered everything for us. An elaborately designed bowl of rice was placed in the middle of the lazy susan turntable. We each had a cold glass of Cin-Cau, a sweet grass jelly drink. On the turntable was the following dishes. Cap Cae is basically Chopsuey or Mixed Vegetables. The Nyonya version tasted different from the ones that I had. There was a citrus and zesty flavor added to the dish. Sambal Sotong or Squid with Sambal Sauce. The Squid was perfectly cooked, it was soft and tender. The sambal sauce wasn't too spicy and it was kind of sour. The citrus and zesty flavor was also present in the dish. Asam Fish Curry. This dish was really interesting, it was the perfect description of Nyonya cooking. The pan fried fish was very Chinese while the curry sauce was like no other curry I had before. There were elements in the thick sauce that makes it Indian, Thai and Chinese. The base was coconut milk and I tasted hints of ginger, turmeric, lime and there was sort of a sour Thai component which I think is Galangal. Ayam Serai. Lemongrass Chicken with a rich thick gravy. This again is fusion cooking between Chinese and south east Asian food. The skin was crispy, the chicken has hints of lemongrass and the gravy was again a mixture of Chinese, Indian and Thai spices and herbs. For dessert, we had Cendol. A traditional dessert which consists of shaved ice, coconut milk, sugar syrup and strips of jelly. I'm so familiar with Chinese flavors and I've eaten authentic Indonesian, Indian and Thai dishes. The Nyonya food experience was totally new to me, the harmonious combination of all the flavors from each region was truly amazing and unforgettable. That afternoon, while taking a leisurely stroll in Jonker, we came across a food cart that was selling Popiah. It is essentially lumpia or spring rolls, a Chinese delicacy that is widely available all over Asia. The cunchy fried lumpia had vegetable filling inside that was topped with a sweet spicy sambal sauce. We also saw people crowding over Steamed Dimsum cooked right on the street. The familiar smell was stimulating but we decided to skip the dimsum to make room for Melaka's famous Chicken Rice Balls. We didn't have a hard time to find Restoran Famosa, the resto looked like an old Chinese resto which was screaming red. Upon entering, we were startled on the resto's interiors, it felt like we traveled back to the past. Walls were painted red, huge Chinese lanterns hang from atop, the tables and chairs were designed like the ones we see in old Chinese movies and there was even a small courtyard inside. We ordered a set of Chicken Rice Balls and half a chicken.Everything was served together in a small plate, the rice balls and chicken were on top of a light soy and scallion sauce. The chicken pieces were tender and tasty but it was the Chicken Rice Balls that I found unique and interesting. The Chicken Rice Ball was made up of ground up sticky rice formed into pinpong sized balls. Whenever I see 'sticky rice' on the menu, I would automatically assume that it would be used as part of a dessert. Famosa's rice ball was no dessert, it was the first time for me to eat a savory sticky rice dish. The balls were so tasty, I'm not a fan of sticky rice but I ate three chicken rice balls and wanted more. 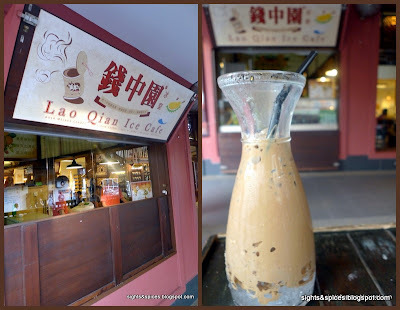 As the last stop for our Melaka food journey, we had Iced White Coffee at Lao Qian Ice Cafe. Though white coffee is served with condensed milk or creamer, authentic white coffee uses coffee beans that are roasted with margarine. This process is supposed to bring out more of the caramel flavor of the beans. Lao Qian Cafe serves the cold concoction in a Carafe with a frozen solid block of ice at the bottom. At first sip, I found the iced coffee too sweet for my liking so we let the ice melt first before sipping everything up. 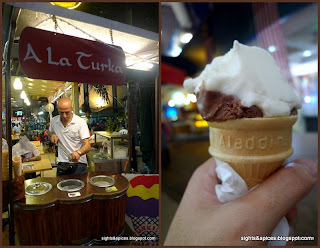 When we got back from Melaka, we headed back to the hotel and felt that we wanted to grab a midnight snack. 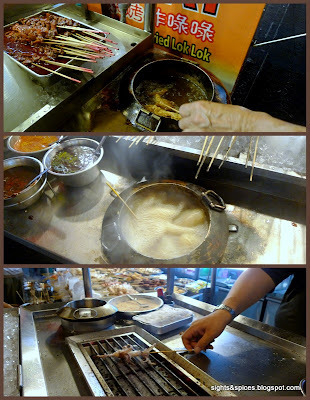 We walked through the streets of Masjid Jamek and found this small Hawker Center. We ordered a plate of Nasi Goreng Ayam or Chicken Fried Rice. The simple fried rice was tasty, it had bits of chicken and string beans. What's so nice about the dish was the fragrant long grain rice that was used. A steaming bowl of Asam Laksa. A fish based sour noodle soup dish which uses thick rice noodles. A piece of a highly addicting flaky Roti with Curry Dip. After our meal, we drank Teh Tarek or Pulled Milk Tea. Just look how amazingly thick the froth was. Even if the place looks shabby, the food was so good and the quality was excellent. The next day after visiting the Batu Caves, we checked out the row of Indian restaurants in the area.As I always say, when it comes with Indian cuisine it's either you love it or hate it. When we were walking to choose which resto to dine in, the strong and distinctive pungent smell was all over the place. We ended up dining in Restoran Rani. The restaurant only serves vegetarian dishes. On every table was a cylindrical tub shaped stainless sauce container, it conatains a tomato chutney, a coconut chutney and Dhal. Dhal is a ground up mixture of lentils and beans, Indian food uses Dhal as dip and sauce for a lot of the dishes. We ordered a Thali Plate, a circular stainless plate with a variety of vegetable dishes with rice on the middle. I'm not familiar with names of each dish but there was a radish dish, a sweet potato dish, a cucumber carrot dish, a cauliflower dish and a small pickled vegetable that I'm not familiar with. The vegetables dishes were cooked really well, the vegetables still has a bite into it. While we were eating, the Indian server who does not speak English got a laddle full of Dhal and spread it over the rice. He said something that I understood as "this is how you eat Indian food." We also ordered Wada, the texture and flavor of the donut shaped bread was like eating a spiced donut. Upon doing research, Wada is a popular snack in Southern India and it is made up of Dal, Lentil and Gram Flour. I tore pieces of it and dip it in the different sauces. The tomato and coconut chutney was so tasty and delicious. When it comes to chutneys and curry sauces, no one makes it better than the Indian people. As we took sips of the Special Masala Tea, I think Jim and Jon had an overdosed of the pungent Indian smell and flavor. They told me that they had enough Indian food for our trip. The Masala Tea tasted so alien to us, the tea tasted like soup broth. I tasted garlic, cinnamon, ginger and pepper in the Tea. This definitely was the most authentic Indian meal I had, the smell and flavors was more distinct and more pungent. While we were in Jalan Petaling it started to rain and we quickly took refuge at one of the many Hawker centers in the area. Majority of the hawker stalls that can be found at Tang City Food Court were serving different Chinese Dishes. We had a hot bowl of Roasted Pork Noodles. The sweet, salty and tangy roast pork was moist and tender while the noodles were nice and firm. There was a lone Thai hawker stall in the food center so I excitedly ordered a plate of Crab Cakes. The Crab cakes was really nice, the crab flavor was intense and the dipping sauce was very Thai like. The favorite dish for that night was the Spicy Seafood Claypot Rice. The pieces of Squid, Fish and Shrimp on top was seasoned and cooked well. The rice at the bottom was so addicting, it was seasoned with a spicy sate sauce. The day after, we headed to Mid Valley to have a gourmet lunch at Sage. Sage was once considered as Malaysia's best restaurant. After lunch, we checked out Mid Valley Megamall and had our afternoon snack in a snack bar that was inside a department store. I've read reviews that Deli Terra Garden serves good beef rendang and laksa. We had two kinds of laksa, the Penang Asam Laksa and Ipoh Curry Laksa. The Penang asam laksa was thicker and tastier compared to what I had in the hawker center. Penang is a state in Malaysia that is known for great food, some people even consider it as the food capital of Southeast Asia. Ipoh is the capital of Perak, where most of the people living there are Chinese. The Ipoh Curry Laksa was very comforting and hearty just what I expected from Chinese curries. The broth was thick and rich with chopped pork innards, string beans and a piece of hard boiled egg. And rather than the thick rice noodles that was used in Penang Laksa, the Ipoh Laksa uses egg noodles. Among all the Laksa, my favorite would be the curry laksa. The beef rendang was so fragrant, it smelled of coconut, garlic and lemongrass. The sliced pieces of beef were moist and tender and the harmonious blend of the herbs and spices was so flavorful. Definitely one of the must try dishes in Malaysia. The night before we were headed back home, we were walking around and came across Restoran Soong Kee. It was already late during that time but there were quite a number of locals inside. We took it as a sign that the resto serves great food. As soon as we entered, we heard the rhythmic chopping sound of the cleavers against the chopping board. I got excited, the sound that was resonating inside was for making beef balls. The restaurant surprisingly serves noodles and beef balls only. We each ordered a set of Dry Noodles and Beef Balls Soup. The tasty and savory noodles was doused with a spicy sate sauce with Bokchoy on top. The beef balls looks simple yet it tasted divine. This is not your ordinary meatball, the texture was like a fish or squid ball but tasted of beef. The beef was finely chopped until it turned into a starchy consistency then formed into balls. The Old Town White Coffee Cafe is found all around Malaysia. Before boarding the plane, we got to try out a hot cup of White Coffee. Though I still prefer my coffee black, Old Town's coffee was sweet, smooth and creamy. If there is one place that I regret that we didn't visit, it is Penang. 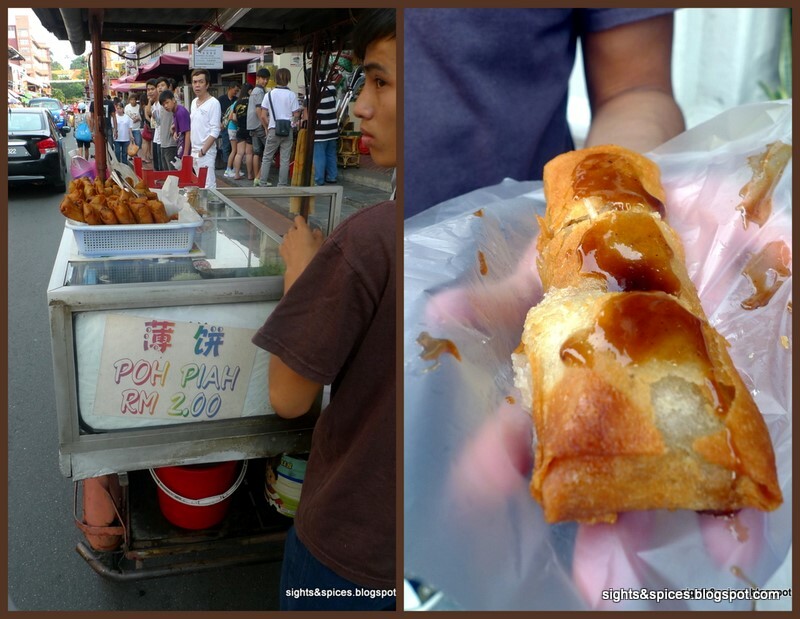 Penang is known to be one of the best places in Asia to feast and succumbed to gluttony. But then, after all the aromas and flavors that I've sniffed and tasted, i'm pretty sure I'll be back again. ( Next time around, Penang would be on top of my list). Also, I understood why many Singaporeans head over to Malaysia just to eat when everything can be found right in their own country. Food was way cheaper but the quality was excellent, I felt that Malaysia's food scene was so underrated. But now I know better, if there is one reason why people should visit Malaysia, food would rank number one. I love this post! I was searching (with no luck) to know about the three spices in Restoran Rani and now I know from this post. Thank you! :) ... and you ate a lot in Malaysia! Awesome. hi rose! luckily for me the server understood when i asked him what the three spices are. some people shop when they travel, we eat!! =) thanks!